This blog entry about the events of Saturday, December 11, 2004 was originally posted on December 17, 2004. DAY 420: If there’s one distinct memory of Hanoi that Western tourists will bring home, it’s the image of Hanoi’s crazy traffic, a majority of which is comprised of motorbikes. Hanoiites (Hanoiers? Hanoians?) zip around the streets, sans helmets, to get to where they have to go in any way possible with only a few intersections with regulatory traffic signals. Most Westerners I met found the madness of it all sort of terrifying, and thought it crazy to ride on the back of a motorcycle taxi, let alone drive one. “I’D LIKE TO RENT A MOTORBIKE,” I asked the nice young lady at the desk of my hotel after stepping out briefly for pho, the Vietnamese rice noodle soup staple served almost everywhere in town. She made a call and in three minutes a man arrived with a Honda Dream. I signed a release to abide by the rules and pay the 80,000d (about $6 USD) for the whole day. He gave me the keys and zipped off with on the back of another scooter his partner was driving. Awesome, I thought. Motorbikes have always been synonymous with the cool, from James Dean to Fonzie on Happy Days. My little Honda was nowhere near the cool bikes of the two American idols, but it would have to do. I turned the key to the “on” position and nothing happened. And then I remembered, Oh right, I’ve never driven one of these before. I just figured it’d be just as easy as a motorbike in an arcade game, the kind with the simulated handlebars, so I looked for the “start” button. There it was in plain sight and I pushed it. The engine started. Oh yeah! I revved up the thingee on the right handle and the engine roared even more — but it didn’t go anywhere. The woman from the hotel came to my aid — or rather, she came over to stop that idiot from obnoxiously revving his engine in front of the lobby. “Here,” she pointed out. “One, two, three, four.” She explained the doohickey near my left foot, which was the gear shifter apparently. Oh right. Gears. This thing has gears. I shifted into first and the bike started moving. Alright, now we’re cookin’. 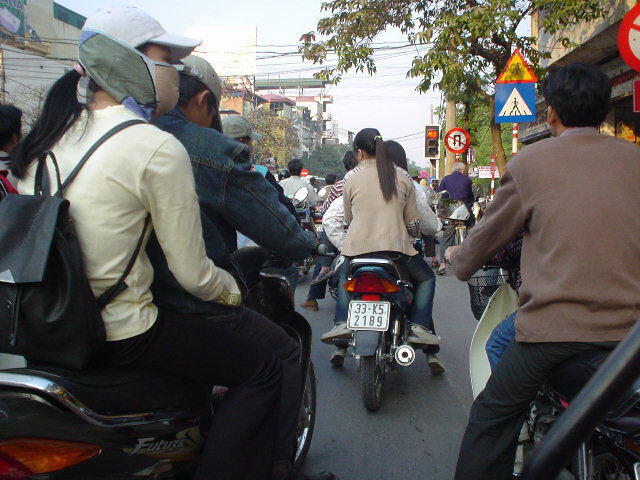 Soon I was out of the alleyway and into the madness of Hanoi city traffic. Concentrate, I thought. It’s just like a video game. I sped down the main road in true video game-style: using the accelerator, dodging cars and whizzing by pedestrians, and all without a helmet. Riding a motorbike was a lot trickier than I thought; suddenly I had to abide by one-way streets and traffic lights. This thing is really going slow, I thought. Oh right. Gears. I shifted up to fourth (the highest) and left it there all day. “YOU COULD DO THE TOUR OF DEAD COMMUNISTS around the world,” Ed said, about four months ago on the drive up to The Great Wall of China. “You can do Mao in China and Ho Chi Minh in Vietnam,” Sam said, a couple of weeks before that when we were on line to see the body of Russian Communist leader Lenin in Moscow’s Red Square. For my first point of interest in Hanoi, I went to complete the Dead Communist Leader Trinity and zipped off to the mausoleum of Ho Chi Minh, where the body of the famous leader of Vietnam was placed to rest and be honored by pilgrims, despite his specific request to be cremated. The mausoleum was in the center of Ba Dinh Square, the famous square where he had declared Vietnam independent from the French in a moving speech on September 2, 1945, announcing the Democratic Republic of Vietnam, which eventually became the Soviet- and Chinese-supported North Vietnam. I parked my bike on the south end of the square where the big tourist buses were and strolled up to the bag check-in. “What country are you from?” the military uniformed female guard asked me. “Oh, you are very handsome!” She said something to the other female guard and they snickered in Vietnamese like a couple of schoolgirls. Chicks dig a guy with a bike. Nearby the mausoleum was Uncle Ho’s house and Uncle Ho’s museum and the One Pillar Pagoda, not created by Uncle Ho, but by Emperor Ly Thai Tong in the 11th century. Most of these places were closed for a mid-day siesta, so I skipped out on them and went back to my motorbike. “No, that’s okay.” Much to his surprise, I hopped on the seat of my own motorcycle, revved the engine and pulled away, feeling quite the rebel. THERE’S A SAYING THAT GOES, “History is written by the winners.” Nowhere is that more evident than at the Hoa Lo Prison, my next stop on my self-made motorbike tour. While Americans will always remember Hoa Lo Prison as the jail where American POWs were held captive — thus some referring to it not as “Hoa Lo” but as “that Hanoi pit of Hell” — the Vietnamese government has led its visitors to remember it as the place where Vietnamese revolutionaries were held captive and tortured during the French occupation. Paintings and memorial sculptures were erected throughout the compound, and even the former cells were fashioned with Vietnamese-looking mannequins for added effect, from the big rooms, the solitary confinement “dungeon,” to death row. It was here that the French held patriots like Phan Boi Chau and Nguyen Luong Bang and future General Secretaries of the Vietnamese Communist Party, Truong Chinh and Le Duan — who eventually worked to defeat the French in the first Indochina War. Of course the Vietnamese tourism authority isn’t completely ignorant of the second Indochina War, a.k.a. The American War in Vietnam — it’s just not the main focus of the exhibit, and understandably too. The American POWs were mentioned as a sort of by-the-way, like “(Oh yeah, the American POWs were here too),” in a little section allotted for their time there. An introduction panel stressed that the Americans held captive there were treated well (including one John McCain who eventually became a US senator) and in fact, all the photographs in that gallery showed Americans quite happy, playing ping-pong and volleyball, having sing-a-longs, and cooking together. In this “Hanoi Hilton” (a nickname given by Americans, which they pointed out), it seemed like being a prisoner there was like a spending a day at day camp. Like I said, history is written by the winners. Whatever version of the past you believe in, the truth I will report about its present is clear: Hanoi is ready to move on. Over half of the former Hoa Lo Prison had been torn down to make way for the Hanoi Towers built over it, a luxury hi-rise of corporate business and residential space, complete with a mall, supermarket, swimming pool and bar that makes really good bacon cheeseburgers. (Bet you can’t guess what I had for lunch.) From what I saw, the newest occupants of the former Hoa Lo, including what I presume were American ex-pats, were now really living it up. “UH, TEN THOUSAND?” I asked hesitantly with ten fingers up to explain myself at the gasoline station. My fuel gauge had been in the red zone all day; I was surprised how far I’d gotten without filling up the tank. “[Something something],” the female attendant said. With her body language, I managed to figure out she was saying, “If you want me to give you fuel, you have to pop the seat up so I can get access to the tank, stupid.” Cluelessly, I lifted the seat with all my might until she rolled her eyes and took the keys from me to unlock the seat using the keyhole on the side. Oh right, the key. To unlock it. She did it for me and filled me up. The 10,000d (about 65 cents) got me 3/4 of a tank, more than enough to really crank it. I revved the engine and took to the streets again, passing the French-style Opera House in town, and rode off to my next destination. NOT ALL TOURISTIC SITES IN HANOI involve history in the 20th century. Rewind about a thousand years and you’ll see a much less hectic Vietnam, a time when Emperor Ly Thanh Tong founded the Temple of Literature, the first national university, dedicated to Chinese prophet of wisdom Confucius. Like the Confucius temple I’d seen in Beijing, this Vietnamese complex had shrines to great wise man, places of reflection and a series of steles where the names of the graduated scholars were etched into. I was pretty confident on the bike around afternoon rush hour to just have fun with it and just speed around aimlessly. I head for the highway too to crank it as fast as I could go. The speedometer was broken, but I figured I got up to 40 mph. I took the highway back and forth and even followed the congested mass of traffic on the Chuong Duong Bridge over the Red River out to the suburbs. At one point I was in between the highway divider and a bus moving into the fast lane. I zipped in between and cut the bus off. The bus driver just honked his horn at me as I sped away. I ended my day as a “tourist without a cause” running errands — booking a two-day tour to Halong Bay the next day and my overnight bus to Hue the evening after that — before heading back to the hotel. Paul, Lisa, Jim and Dara were amazed when I told them I’d been on a motorbike all day; both couples had a much less hectic day of lounging around and shopping the Old Quarter. We did a bit more shopping that evening on the way to dinner at Cha Ca La Vong, the proud “oldest restaurant of Vietnam” since 1871, which only had one item on the menu: their specialty cha ca, slices of fish fillets grilled on a sizzling platter of aromatic oil in the center of the table, served with green onions, coriander, peanuts and chilies. We sat and ate and then traded Blog addresses (including Jim’s “Rover the Bear” Blog) in my last session with my “platoon.” The couples went out afterwards while I just retreated back to my hotel room to attend to Blog duties with my laptop. I sat the rest of the night and wrote about my version of the history of the day — after all, I did win that little duel I had with the bus on the highway. GREETINGS FROM HO CHI MINH CITY which everyone just abbreviates in the written word as HCMC and in the oral word as “Saigon.” I just came in and boy is my train tired! Here are the two I had on deck when I was leaving Hue. More to come; this hotel has free internet, and it’s fast! Way to brave renting a bike in Hanoi. It took a while for us to get used to crossing the streets on foot. The Cu chi tunnels in Saigon are pretty interesting if you get to go. Don’t go through if you’re afraid of small spaces though. The tour drivers in Hanoi were some of the craziest. The drive up to Halong Bay was a nightmare for everybody crammed in that van. Way worse than the convoy coming back from Luxor. That picture of you on the bike in the mirror just kills me…haha..
Will you be in VAN early March? b-b-b-badddd ... bad to the bone !!! “Chicks dig a guy with a bike.” No truer words spoke.